This overflowing ditch by the side of Broadway Street S.W. looks like a job for the new Albany storm water utility, which the city council on Wednesday night voted unanimously to create. But whether anybody is willing or able to solve this particular case of unwelcome runoff remains to be seen. 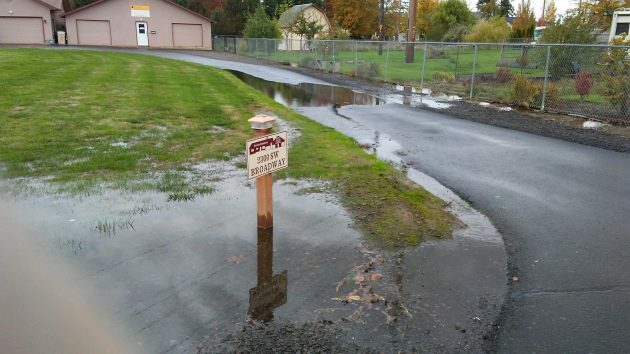 As it has discussed for more than a year, the council formed the new drainage utility in order to impose and then collect a storm water fee from everybody who pays water and sewer bills in the city. It plans to consider a fee resolution later, and the monthly charges — which I have called a rain tax — would then start showing up on city utility bills in the spring. For most households the fee will be about three dollars a month; for utility customers with lots of roof area or parking lots it may run into more than a thousand per month. For details, see a previous report here. 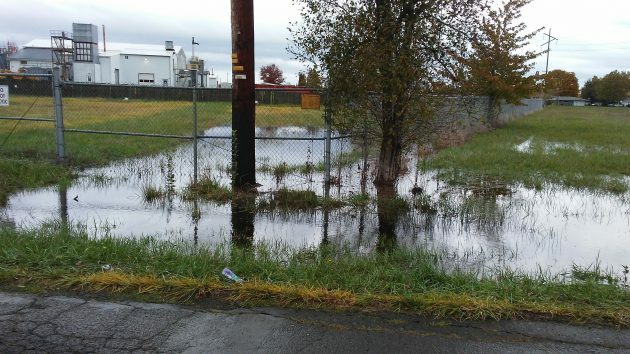 The fee revenue is to replace and augment the $1.3 million the city now spends per year on handling rainwater, and to upgrade its storm drainage system over time. 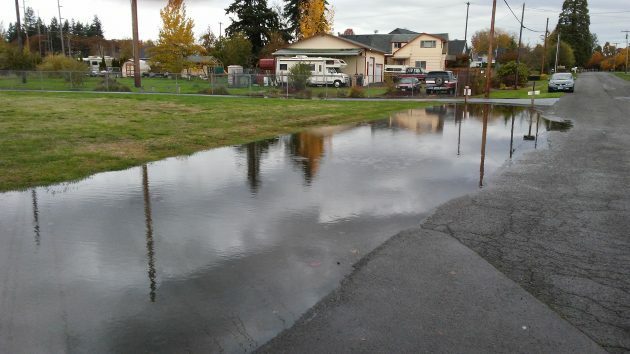 The timing was coincidental, but on Wednesday afternoon I heard from a resident on Southwest Broadway Street about a watery problem in her block of the street. I went and took a look, and the photos show what I saw. It hadn’t rained all that much the last couple of days, but the west side of Broadway was under water, and a smaller but apparently deeper pond had formed on the east side as well. From there, the water was flowing across the driveway of 2300 Broadway S.W. and into neighboring yard, apparently on its way to the Calapoooia River. Matthew Prudell, whose driveway the new stream crosses, told me neighbors who have lived there for 20 years say this is the first year that this phenomenon has occurred. Across the street from his place, there is the Department of Energy Albany Research Center, the south portion of which is an undeveloped meadow. It looks as though all that water pooling on both sides of Broadway Street — and likely to overflow the street when it really pours — drains from the expanse of federal property. Prudell understands that in the 1950s, the then-U.S. Bureau of Mines built a big leach field underneath the vacant grassland to take care of water coming off its property. He surmised that somehow this drainage system has failed. Broadway Street is still a county road, even though properties on its west side were annexed by Albany a long time ago. Prudell says he’s talked to Linn County, to people at the city, and to the Feds across the street. So far he’s not found anyone eager to do something about channeling all that water away. The water seems to come from there, the Albany Research Center’s land. Eventually it crosses the driveway at 2300 Broadway St. S.W. I take Broadway often to go to my folks place a bit south of there, and just two days ago, the ditch in the photo was much lower, but I saw utility guys checking the situation out. This section of Broadway has always been county, narrow, and dangerous for residents that live on it. When they were annexed to the city, you would think the street would be too! Our county and city work together on many things, but getting the Feds here, the Bureau of Mines or whoever they are now, to offer assistance for flood control or even an upgraded street will be another story. If the field is indeed owned by the Department of Energy, they do have money for construction projects. If the leach field has failed after 60 years, they may be in a position to take care of it. First thing would be to find the owner of the field, and if it is the DOE, then contact them about allocating money to address the situation, as it does appear to be impacting the neighbor and neighborhood. There’s a lot more to that puddle than meets the eye. According to a 1980’s era remediation report from Argonne National Laboratory, Plutonium 238 and a radioactive isotope of silver (Ag110) were found in “suspended solids” near the Broadway drain tiles for that field. I’m guessing that’s the area, so I call that the Plutonium puddle. Since they found other radioactive isotopes up to 9′ underground, I’m guessing (despite their best remediation efforts) stuff is still migrating. I walk that route everyday. I’m not terribly worried about it, as long as nobody drinks from the puddle! At this point we believe that the drainage problem is caused by water backing up from the Department Of Energy property.